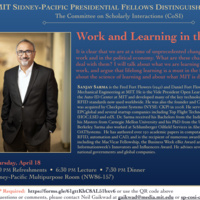 Come hear Professor Sanjay Sarma speak about "Work and Learning in the Future," a discussion of how both work and learning might change because of our changing technology. Refreshments will begin at 6PM in the Sidney-Pacific MP Room (NW86-157). Professor Sarma's lecture will be held from 6:30-7:30 PM, and you can enter your name to a lottery for dinner with the speaker at 7:30! RSVP here (https://forms.gle/61gttKhC8AL51bxv6) and contact Neil Gaikwad with questions (gaikwad@media.mit.edu).